Azea Augustama (born August 2, 1983) is a Haitian boxer who qualified for the 2008 Olympic Games at light-heavyweight through a bronze medal finish at the second Americas qualifier. 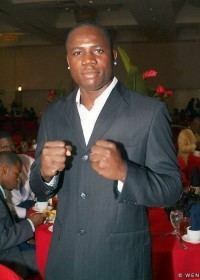 In 2008 he also won the National Golden Gloves. At the 2007 PanAm Games Augustama lost in the quarter final. At the 2007 World Championships he competed at 201 lbs, while his younger brother Elie competed at 178. Both lost their first bouts, and Azea dropped down to 178 afterwards. His older brother Emmanuel fights at super heavyweight. All three brothers and their father work in a construction company. At the first Olympic qualifier he was shut out 0-11 by Carlos Negron. At the second, he lost to PanAm Champion Eleider Alvarez in the semifinal bout but defeated Mexican Ventura Vasquez in the all-important third place match. As of October 2007, his record was 60-10. The Augustamas have lived in Florida since 1990 and Azea won the local Florida Golden Gloves. The other brothers, however, do not possess dual citizenship. In 2008 he was able to compete in the National Golden Gloves Tournament of Champions as a non-citizen and won the tournament. As of late 2014, Augustama has 20 fights as a professional, with 18 wins and 2 decision losses to Edwin Rodríguez and Denis Grachev.